www.newmanfilms.net: WARRIORS TWO - Underestimated Masterpiece? WARRIORS TWO - Underestimated Masterpiece? 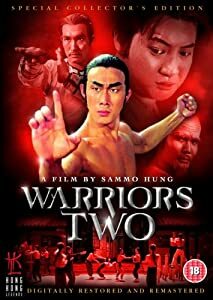 Warriors Two is a late 1970's Kung Fu film that is raised above the average by one of the most realistic Martial Arts displays of Wing Chun in "Chop Socky" cinema. A nice body of work by the amazing Sammo Hung was cemented somewhat by this classic that is often overlooked by the more famous "Prodigal Son" in terms of the kung fu it demonstrates. I strongly urge you to watch the link in the top right hand corner, which is our film of the month! Excuse the version on display and try to find the un-dubbed original if you can or the ecellent remaster as highlighted on the image above.